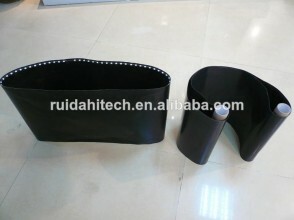 the belt is made of high tensile fiberglass or Kevlar, knitted by special equipment and coated with fine PTFE. Seamless belt overcomes former problems of traditional joint fusing machine belt such as bad stability, ruptures, and deflecting for different girth on two sides at the joint. The using life of seamless PTFE Fusing Machine Belt are much longer than all kinds of joint PTFE Fusing Machine Belt. with static-resistance varnished cloth inside and tearing-resistance fiberglass cloth outside, 2ply belt has a great improvement on its intensity, long using life, well balanced thickness, excellent deflecting preventing capacity, smooth surface, it’s better for super thin fabric fusing. Seam fusing machine belt is made of fine material. The surface is smooth and luster and the price is competitive. It can substitute imported high price belts.